On the South Dakota prairie, Delores and Darrell and the other kids who attend their schoolhouse are used to braving rough weather conditions during the winter months. When a record-breaking blizzard hits, however, and Delores and Darrell become stranded at the schoolhouse with their teacher Miss Martin, they may not be quite prepared for the unusual difficulties they will face before the storm ends. 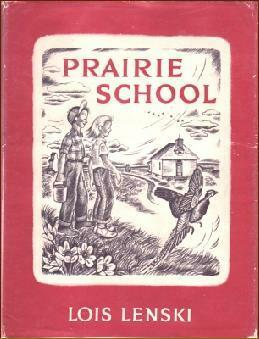 Prairie School is part survival story, part educational text about the lives of prairie farmers in the late 1940s. Though the characters are fairly well-described and have individual personalities, the setting itself is really the main character of the book. Through the eyes of Delores and Darrell, the reader experiences the daily and yearly rhythms of farm life, with its associated difficulties and dangers. There are lots of great details about kids walking miles to and from school in the snow, helping to round up wayward cattle, recognizing signs of bad weather, worrying about whether the schoolhouse has enough coal, and generally experiencing a much less sheltered way of life than exists today. The characters are appealing, but it is the way they live that drives the story and makes it so interesting. The illustrations by the author are just as well-done as the text. They are charming pictures, depicting in detail key scenes from the story and showing how the characters dress and what their school and homes look like. Though there are only two or three illustrations per chapter, some of them occupy full pages, and they really help develop the visual elements of a time and place most readers can only imagine. 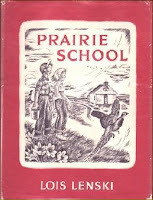 Prairie School may not be as distinctive and memorable as Strawberry Girl, Lenski's Newbery winning title, but it was an engaging and quick read in its own right. I am always fascinated by stories involving schoolhouse so that was an enjoyable aspect for me, as was the suspense at the height of the story when Delores's health is in danger and it is unclear how she will receive treatment. Reading this book has made me want to explore Lenski's other regional stories -if they're all as good as this one, I have many treats in store in the coming months!